When it comes to family days out, many people find it easier to load up the car with children, snacks, all-weather gear and drive off somewhere for the day. And of course, if you have children, this is a far easier option than the alternative. But, with a little planning and forethought, it is perfectly possible to plan family excursions without the car which are neither hassle-filled nor inconvenient. It is a simple case of repositioning your mind to see the car as non-essential. Firstly, do not look upon family days out as something which you have to travel for a couple of hours to enjoy. There are not many places in Britain which are without any areas of interest at all - and if you have young children, the simplest place can prove a place of infinite possibilities. Therefore, if you have decided to leave the car at home, start off by planning excursions close to home. The local park may not seem like the most exciting destination to you but it can be a great place for a family day out, especially if you do not visit it very often. Small children will be enthralled by feeding the ducks or the geese and a play park will also provide plenty of entertainment. Look on it as a day out instead of popping to the park. Take a picnic and the park will seem infinitely more exciting. Also think about taking a football or tennis rackets to break up your day. Bigger parks also often have events on, such as bands playing. Check this out before you go and time your day out to coincide with something like this. 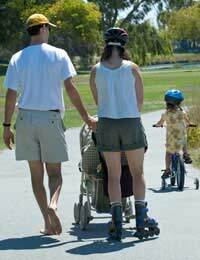 If there is nowhere you can take the family for a day out within walking or cycling distance then public transport may be the only option for a day out without the car. This does not have to be the nightmare it sounds. Many public transport companies have cottoned on to the fact that parents want to leave the car at home and have started offering joint tickets which include transport and entry into an attraction – which means you can save lots of cash by travelling by public transport. If you choose an indoor attraction, you do not have to worry about making sure you have plenty of wet weather gear. But even these attractions do not have to be places miles away which involve long train journeys. Look in your local big town or city – most have plenty to do that you may not have even considered before. While you may dismiss some of the smaller museums as a waste of time, they can often be far more interesting for youngsters than huge places which are teeming with people. The more niche a place is – think pencil museum or local museum – the more chances there are that children will be able to get hands on and really interact with what they are learning about. Obviously, the more children you have and the wider their range of ages, the harder it can be to plan excursions without the car. But think of the exercise the children will get walking to place, as well as what you are doing to reduce your carbon footprint and you will see that it is all worthwhile. If it really seems like too much for one or two adults to handle, rope in friends or relatives to help out, with the promise of a free lunch as an incentive!